And don't worry: even though this is my final post on this blog, JuliaMadeline.com will stick around so you can browse the archives anytime and remember what my life was like before Henry came along (in fact, I can barely remember that far back already, and it's only been a week!). To all my loyal JuliaMadeline.com readers over the past two years, I say thank you. It's been fun...but really, the fun is just starting. So what are you waiting for? Get yourself over to JuliaandHenry.com! Speaking of sleep, that's something that Mom and Dad having been getting much of since Henry came home. As promised, next week I'll be back with lots of new pictures and videos from our first week with Henry. Have a great weekend! I got some great gifts for my birthday. In fact, I got so many gifts at my birthday party that Mom and Dad have put several of them away and will be doling them out over the next several weeks. But there were a few presents they wanted me to have right away, like the stuffed Daisy Duck and Goofy dolls that Abby and Sophia got me. Mom and Dad decided to pull the old trick where they put them out downstairs in the morning and then get a video of my first reaction as I come down an see the new gift. Well this time, I didn't have quite the response they were expecting! Now, of course, I love both Goofy and Daisy, but I sure pulled a good trick on Mom and Dad by making them think I wasn't interested! Happy birthday to me, and welcome home Henry! I'm not at all exaggerating when I say that yesterday, May 25, was one of the biggest days of my life. First off, I turned 2, so happy birthday to me! And then, Henry came home from the hospital. Welcome home, baby brother! While Dad went to the hospital in the morning to get Mom and Henry, I went with Bobbi and Dido to a Memorial Day parade. There were fire trucks and police cars and ambulances — basically, all my favorite things! I had a great time, and then we went to the park where I had tons of fun as Bobbi pushed me on the swings. Then we went back home, just in time for Henry's big homecoming! I rushed right up to him and gave him a kiss. After my nap, I learned that Henry had a big surprise in store for me: he got me my very own play kitchen for my birthday! I love it so much! Now I can cook myself while Bobbi and Mom are in the kitchen. If he keeps doing nice things like that, he can stay here as long as he wants! I could tell that Mom and Henry were both very happy to be home. I will say this about Henry: all he seems to do is cry, sleep and eat. Doesn't he get bored with just doing those three things? Mom and Dad say I used to act the same way, but I think they're making that up. 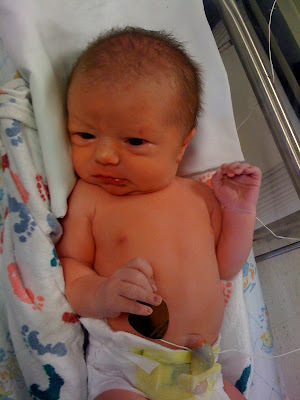 Yesterday was a crazy day, and this week looks to be more of the same as we adjust to the family's new addition. So far, so good: Mom and Dad got through the first night without too much trouble (though Dad did accidentally step in a dirty diaper and tracked Henry's poo around the carpet before he realized what happened). In fact, Dad said the only thing he was worried about was that Henry's cries would wake me up. Don't worry, Dad, I'm sure that will happen before too long! And don't worry, I have new photos too! So tomorrow is a HUGE day. Not only is it my second birthday, but Mom and Henry are coming home! I can't imagine it will be anything but good times all around and no tears from anyone, right? Whatever happens, the fun starts tomorrow! So this was my second day with a baby brother, and I was very anxious to see him (and Mom) again. In the afternoon, we went back to the hospital with Grandma and Grandpa. Unlike yesterday, I warmed up to Henry immediately, waving hello and giving him a kiss. In fact, I gave him lots of kisses! But my favorite thing today was imitate the way Henry yawns. I did it during the whole visit and then all night after I got home! Here's a video of what Henry's second day was like (and look for my Henry impression too!). I hear that if all goes well, Henry and Mom will be coming home on Monday. What a great birthday present that would be! Mom and Dad have been telling me for awhile now that I was going to be having a baby brother "soon," but I didn't realize they meant this soon! This morning at 8:25 a.m., my baby brother Henry Joseph was born, two weeks before his due date. He weighed 8 lbs. (less than me) and measured 20 1/4 inches (more than me). And just like me, he arrived on the Friday before Memorial Day weekend. How weird is that? I got to meet my baby brother, though Dad says I cried more during my hospital visit than Henry did. He's awfully adorable, and I liked waving to him and watching him (and I think he liked watching me too!). I was a little disturbed when I first walked into the room and saw Mom on a hospital bed, with nurses I didn't know and a baby I didn't know, but Dad walked me around the maternity wing and helped me relax (the cute Anne Geddes baby pictures on the walls did the trick too). There will be lots of photos in the days and weeks to come, but for now, take a look at this video of some of the highlights from Henry's first day. Thanks for stopping by! I've been blogging with the best of them since the day I was born (and I mean that literally). Check back frequently for the latest news about my hectic lifestyle, and plenty of cute photos and videos, too. If you're new to the site, or you just want to take a trip down memory lane, make sure to browse the blog archive for my earliest postings. And don't forget to drop me a line. I'm the cutest little girl you've ever seen! Don't take my word for it, just check out all my adorable photos!